So how should we handle federal officials who’ve become unethical researchers and prosecutors – determined to get convictions, basing their cases on esoteric circumstantial evidence, allowing tainted and fraudulent evidence, hiding exculpatory information, rewriting the law, and denying defense counsel the right to cross-examine adverse witnesses or present their case? As the Committee For A Constructive Tomorrow explains in its amicus curiae brief to the US Supreme Court, that’s what Environmental Protection Agency regulators have been doing with global warming. They’re pulling every dirty prosecutorial trick in the book, to convict fossil fuels, carbon dioxide, and America’s economy and living standards of “endangering” the public welfare. Since 2009, EPA regulators have shown a single-minded determination to slash hydrocarbon use, drive up the price of energy, and impose huge costs on companies, industries and an economy struggling to stay afloat and retain jobs. They want to control CO2 emissions from vehicles, electrical generating plants, and eventually the sources of nearly everything we make, grow, ship, eat and do. The damage to our livelihoods, liberties, living standards, legal system, health, welfare and life spans will be enormous. 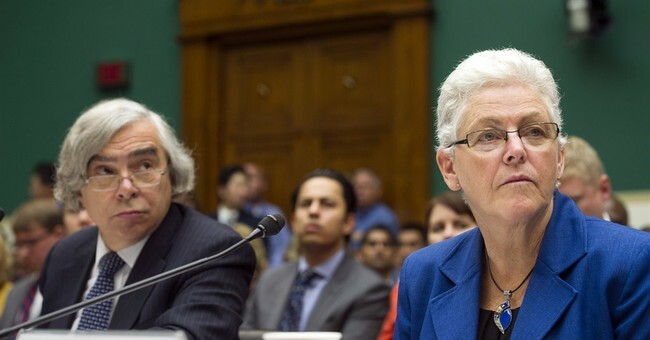 The devious dealings have continued under new EPA Administrator Gina McCarthy, who has pronounced that there is “no more urgent threat to public health than climate change.” Now it appears the mendacious malfeasance is even worse than previously thought. Newly released emails reveal that Ms. McCarthy was “very excited” in 2010 to “finally get the opportunity to work with” Mr. John Beale, who for several years was the senior EPA policy advisor helping Ms. McCarthy and her Office of Air and Radiation develop and implement tough air quality and climate regulations. When he wasn’t off on one of his Walter Mitty undercover CIA capers, that is. It defies belief to suppose his dysfunctions and fabrications did not extend to his official EPA roles of devising agency air pollution and climate policies, then cherry picking reports and manipulating research to justify them. The criminal fraud for which Beale will serve 32 months in prison and repay $1.4 million is outrageous. The fraud on our economy, democracy and people’s lives is far more costly and despicable. Even worse, their regulatory fraud is a pervasive problem throughout EPA. The Constitution specifies that the Executive Branch has no authority to engage in lawmaking, but must faithfully execute the laws as written – and not as regulators might wish the laws had been written, to advance their preferred policy agendas. EPA has violated these most fundamental rules, ignoring inconvenient statutory language, and devising and enforcing other provisions out of whole cloth. Between 1989 and 2010, Congress considered and rejected some 692 bills addressing various aspects of greenhouse gas emissions and climate change. So President Obama’s EPA simply imposed carbon dioxide controls by executive fiat, using “prevention of significant deterioration” and “new source performance standards” to create new authority over coal-fired electrical generating plants. It then unilaterally changed precise statutory emission standards from 250 tons per year to 100,000 tpy – to avoid the public backlash that would come if it began regulating and shutting down all the natural gas generators, refineries, cement kilns, factories, paper mills, shopping malls, apartment and office buildings, hospitals, schools and even large homes that emit more than 250 tons of carbon dioxide per year. Those job-killing rules can come later, when radical environmentalists sue radical regulators, to enforce the statutory requirement. In circumventing Congress, rewriting laws and ignoring the “separation of powers” doctrine, EPA accomplished an unprecedented power grab over the energy that fuels our economy and makes our jobs, living standards and civil rights progress possible. It also flouted clear NEPA, Clean Air Act and other statutory mandates that EPA protect the health, welfare and environmental quality of all Americans. The agency remains fixated on the speculative impacts of sea levels, storms, droughts and other manifestations of allegedly “dangerous manmade climate change.” As CFACT’s amicus brief explains, it completely ignores the increasingly adverse effects that its boiler MACT, carbon dioxide and 1,9000 other Obama-era EPA regulations are having on companies, jobs, families, entire industries and communities – and thus people’s physical, mental and emotional well-being. As breadwinners are laid off or reduced to part-time status, families are unable to heat and cool their homes properly, pay bills, rent or mortgage, buy clothing and medicines, or take vacations. Increasing numbers of families deplete their savings and are made homeless. Being unable to find or keep a job erodes self-worth, self-confidence and psychological well-being. The stress of being unemployed, or involuntarily holding multiple lower-paying part-time jobs, means reduced nutrition, sleep deprivation, increased risk of heart attacks and strokes, higher incidences of depression and alcohol, drug, spousal and child abuse, more suicides and generally lower life expectancies. It means the regulations are far worse than the harms they supposedly redress. For EPA to ignore this simple reality is illegal and unconscionable. For it to do so based on fraudulent science is outrageous. The agency’s position hardly reflected genuine climate science in 2009, when EPA decreed that carbon dioxide endangers human health and welfare. Since then, Earth’s temperature and weather events have refused to cooperate with EPA’s dire predictions. But the agency’s views and decisions remain etched in stone, leaving the agency on the extreme fringe of alarmist opinion, insisting that its views are supported by IPCC predictions that are increasingly discredited by Climategate revelations, investigations into IPCC practices, the Beale scandal and even an exhaustive report by one of EPA’s own analysts. Finally, even full compliance with EPA’s destructive regulations would achieve zero benefits, because emissions from China, India and other rapidly developing countries will continue increasing total atmospheric GHG levels – and because climate change is driven primarily by natural forces, not CO2. For all these reasons, EPA’s carbon dioxide “endangerment” decision must be reversed; its stationary source regulations must be scrapped; and the agency must be required to fully evaluate the consistently adverse effects of its regulatory edicts on human health, welfare and environmental quality. If the Supreme Court fails to do so, the House and Senate must reassert their Constitutional roles. Otherwise the United States will steadily fall behind its international competitors. The health and well-being of Americans will increasingly suffer. And the Legislative and Judicial Branches will become mere bystanders to an unelected, unaccountable, agenda-driven Executive Branch.